I'm not sure how I've managed to miss GoodGuide up until now, but I'm glad to have found their website and to be sharing it on BrandAware. GoodGuide is a brand rating website that is focused on food. The website actually offers one of the most comprehensive sets of data that I've seen in a long time. Every product has a health rating, an environment rating and a society rating, as well as an overall "GoodGuide rating". 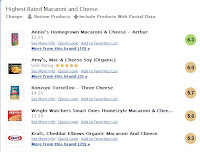 By browsing for macaroni and cheese products, I can see that Annie's Homegrown Macaroni and Cheese is rated better than Kraft's Organic Macaroni and Cheese and certainly better than their regular Kraft Dinner. Then I can actually click on the products to find out why. I'm going to do a more in depth how-to on Good Guide shortly, but for now, check it out and look up your favourite products.